One of the biggest symbols of Japan in the 20th Century, and dogs in General, is the sad history of Hachiko, the Akita Dog who waited for his owner, Hidesaburo Ueno, even though Mr. Ueno was already in a better place. Well. Now after 80 years both of them are finally reunited!... In the form of Statue. The history is familiar to a lot of people. 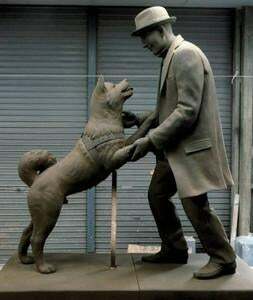 It´s about Hachiko, an Akita Dog, who always greeted his Owner, Hidesaburo Ueno, when he came back from work at the Train station, so both of them could walk together to home. Sadly, in the midle of a Lecture, Mr. Ueno collapsed and fell death. So he never went back home. It is said that, for 9 years straight, Hachiko came every evening to the work station waiting for his owner, oblivious for the fact that his Owner was already resting in peace. In conemmoration a Statue on his name was made. The Story inspired two films: Hachiko Monogatari (1987/ Japanese) and Hachi: A Dogs Tale (2009/ American) which featured Richard Geer and Jason Alexander. I Have to say that the statue is cute and good, oh men this is one of the stories that truly make me drop some manly tears!. So is nice to see a statue that features their reunion in the afterlife.